The book itself is a collection of nearly 400 demotic ostraca and inscriptions, mainly from the Ptolemaic period, found – as the title would suggest – at the sacred animal necropolis at Saqqara. The pieces included in the book were originally excavated in the 1970s. The documents include offerings to sacred animals such as the Apis bull, administrative documents pertaining to the area, and a collection of texts which suggest the existence of a scribal school at the necropolis. 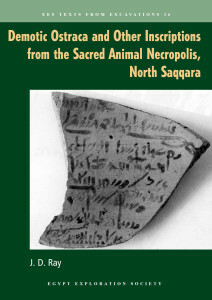 This is the third book John has published from his excavations at the necropolis; previous volumes are The Archive of Hor and Texts from the Baboon and Falcon Galleries: Demotic, Hieroglyphic and Greek Inscriptions from the Sacred Animal Necropolis, North Saqqara. John also published preliminary reports in JEA 51, and there have been a number of other publications on the site by other Egyptologists. Unlike previous books I’ve set, which have come edited and ready-to-go, this manuscript came to me as the original, unedited script (in Microsoft Word), accompanied by a printout with the academic editor’s amendments and notes. What this meant was a slightly different workflow than before. Instead of setting the whole book and sending a pdf back to the author (and the EES) to proof, I had a lot of editor’s queries and suggestions, which needed confirmation as to whether I should leave the text as was, or adopt the suggestion. This meant spending a lot more time in contact with both the author and the editor, with emails flowing back and forth between us all. Adding in the rather tight time-frame we were working to, I decided the best course of action was to set a chapter at a time, which I then sent to the author and editor for checking and query-answering, while I got on with setting the next chapter. This was actually a quite straightforward task, as InDesign – the desktop publishing software I use – has a ‘book’ function which allows you to collect together a set of separate documents, which can be worked on independently, but then exported into one single pdf as the final product. The advantage to this is that I have each chapter in a document of its own, breaking the job down into very manageable chunks. It also means that InDesign runs much more efficiently; working on a single document of 400 pages – especially with a lot of images, as this book has – slows the software down quite significantly. The only major stumbling block I encountered was with the specialist fonts. The book contains not only transliteration of the demotic texts, but also some Coptic and Greek words. When I was sent the manuscript, things didn’t look quite look as they should. The transliteration was littered with odd things, such as copyright symbols and weirdly placed dots (see image). John had originally used three different fonts for the demotic, Coptic and Greek, but although Word seemed to be recognising the presence of these fonts, it just wasn’t displaying properly. I tried to find the fonts online, but I just couldn’t source them anywhere (the manuscript had been typed a good few years ago, I believe; it may be the fonts just weren’t available any more). I was then emailed the font files, but they didn’t work. Even font-converter software wouldn’t recognise them. So, back to Google I went. My hunting then brought me to a font called New Athena Unicode, and it seemed to be just what I was looking for. It’s primarily Greek, but it also has a comprehensive collection of both demotic and Coptic symbols. Not only that, but it’s free and fully licensed for commercial use. Basically, it’s been created by academics for academics. This did, of course, mean that I had a lot of work to do on the transliteration, but with this new font, I was well on the way. So, with some long days, and a bit of hard slog from all corners, we managed to produce the book to deadline. To be honest, I would’ve liked maybe a couple more weeks to mess around with tweaking the text on the page and get it looking just-so, but then again, it’s one of those things you could spend months doing and still find little niggles here and there. It’s like any work of art; you have to stop at some point and decide that it’s finished and ready to go. I would like to take a moment, as well, to thank everyone else I worked with for being so great with helping me get it done. Author John and editor Cary Martin, for answering all my queries so promptly; Kate Spence and John’s wife Sonia for their extra support and assistance; Chris Naunton for not only hiring me in the first place, but for putting up with all my emails; and Ben Hinson, for being a complete and utter star helping out with the images and creating the teeny demotic graphics which needed to be inserted within the text.